Anybody who does not like fire raise their hands. What no hands up? OK, I am not really surprised that the readers of this blog like fire. In that case you’ll be happy to learn that the guys over at Photo Extremist released a video guide [after the jump] on how to make steel wool light painting. We sued to do lots of those in the boy scouts at the end of year fire display. We did not even used the whisk, just put some metal wire around the steel wool. When you go out and do this, make sure you protect both yourself (goggles, gloves, long sleeves) and the surrounding (fire extinguisher, no dry leafs and so on). Those sparks seem small but they are nasty. P.S. if you like playing with fire, check out all the other cool photographs you can take using fireworks. 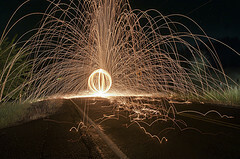 Steel Wool Photography Tutorial via DPS.